In the mid-1800s, the newly built “Ferme Ornée” (or ornamental farm) was very much the fashion for landed estates. Coupled with the Second Marquess’ passion for his Jersey milking cows, the building was used for the milking herd well into the 1900s. But with the pressures of modern farming and estate life, the Dairy was sadly no longer used from the 1970s. With a large L-shaped building in this stunning location, the possibilities for renovation were endless. What we wanted to create above all else is somewhere guests would enjoy staying and feel part of Estate life. Guests can enjoy the Dairy in its largest layout or in the snug versions of the Exeter or Cecil cottages. The kitchens at the Dairy will be equipped with everything you could need – from boiler taps to cappuccino machines, they will cater for your party size, whatever it may be. And there will even be a scullery kitchen hidden in the middle of the property – so if you want some help with catering during your stay, it can easily be done from there. We can even suggest a few local cooks and chefs who can handle that for you. Throughout the property, we are using some furniture from Burghley House, having had it restored and reupholstered locally. We are also hanging pictures of some of the old Marquess’ beloved cattle on the walls, as well as other landscape images of Burghley Park throughout the centuries. Sadly, we had to take down one of the oak trees planted by Capability Brown last year – seeded by the great landscaper himself over 250 years ago – after it was badly affected by Acute Oak Decline. 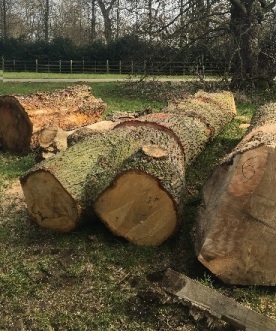 But the tree will live on with its huge history and heritage, as we are crafting it into two oak dining tables with the help of a local master joiner so it can be used in the Dairy for those family dinners or lazy Sunday breakfasts. This amazing building has so much heritage and history that we wanted to keep alive in the conversion and restoration. As such, we are using much of the old wood from the cattle stores, the old cast iron feed troughs have become benches, the old drinkers from each cow stall have become cloakroom sinks, and the doors from the stalls are being used throughout both practically and decoratively. And we’ll have all of the latest mod cons available including high-speed broadband, widescreen TVs for those inevitable rainy afternoons, as well as power showers and huge bath tubs in each en-suite bathroom. The gardens are large and spacious, allowing you to play croquet on the lawns or sit and enjoy a BBQ together while the sun sets on Burghley House in the distance – either that, or watch our rather mad Herdwick sheep trying to escape their fenced boundary!